TMT, Inc. and Affiliates (“TMT”) are a provider of supply chain services to the food and beverage, retail, and automotive industries, including transportation management, warehousing, distribution, and custom packaging. As a part of an overall restructuring plan, the business units of TMT were sold in a 2 part transaction. 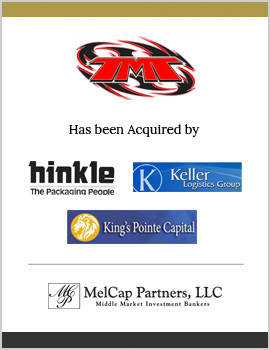 TMT, Inc. and Southpoint Business Park, LLC, sold certain operating assets of its Napoleon, Ohio operation to Keller Logistics Group. As part of a planned sale and liquidation under §363 of the Chapter 11 Bankruptcy Code, certain assets of TMT Leasing, LLC were sold to NOPAC, LLC, an affiliate of Hinkle Manufacturing. Also as part of a planned sale of liquidation under §363 of the Chapter 11 Bankruptcy Code, certain assets of TMT, Inc. and Tony Marks Equipment, Inc., were sold to King’s Pointe Capital. MelCap Partners successfully represented TMT in these three sale transactions, which included the sale of certain assets outside and inside of bankruptcy.